Following a prolonged silence, here are some news about my work (no one could accuse me of flooding your inbox!). 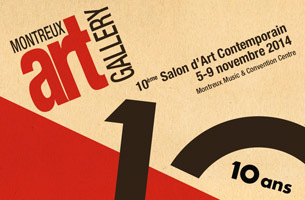 First of all, it is my pleasure to invite you to the 10th Montreux Art Gallery (MAG2014) taking place in Switzerland from the 5th to the 9th of this coming November. Herewith attached is an invitation for two. You will find Patrick Rouchon and myself at stand N°19, under the name ‘Tops Art Gallery’. On this occasion I will be presenting, for the first time in a contemporary art fair, the ‘Nailshading’ technique. Pieces from the ‘Red Man’ series will also be part of the exhibition. Some of you are already familiar with Nailshading, until now referred to as ‘clougraphie’: a technique involving thousands of nails whose shadows “draw” the visual. Since its invention two years ago, the evolution has been great: some of the pieces are now purely kinetic and interactive: they play hide and seek between abstract and figurative. For those not lucky enough to attend the tenth edition of this beautiful contemporary art fair, my work will be displayed at my atelier in Megève, from 13th December 2014 till 15th March 2015. Looking forward to meeting with you in Montreux. L’hiver arrive, de nouvelles « pièces montagne » on vu le jour!